The pawpaw tree (Asimina triloba) is a native fruit-bearing tree that grows in the eastern United States, from Canada to Florida, and as far west as Nebraska. The pawpaw fruit resembles a green mango, and the tree has many nicknames including “Hoosier banana”, “West Virginia banana”, and “wild banana”. The Pawpaw is a fruit tree native to the Eastern United States. credit: USDA-ARS. While there are native varieties, there are also many cultivated varieties that have been improved by plant breeders. Pawpaw fruits ripen between late August and October, depending on the variety. Their flavor is sometimes described as a cross between a banana, pineapple, and mango. Each fruit contains two rows of several brown seeds. The skin and seeds are not edible. The fruit is very nutritious and can be eaten plain or used in desserts. Native Americans have long eaten and used the fruit. Pawpaws have gained popularity among horticulturalists and researchers, and native plant enthusiasts because of their nutritional value and because the leaves, bark, and twigs produce anti-cancer and insecticidal compounds called acetogenins. Deer do not typically feed on pawpaw trees, though raccoons and squirrels are reported to enjoy their fruit. Pawpaws are not susceptible to diseases that we manage in our more common fruit trees. Fungus may grow on the skin of the fruit, but this does not prevent it from being edible. Japanese beetles may feed on their leaves, and should be controlled if damage is observed on young trees. Trees in the Asimina genus are the exclusive larval host plants for the zebra swallowtail butterfly (Erytides marcellus). Pawpaws grow in hardwood forests and thrive in fertile river-bottoms. In the wild, they often grow as an understory tree, in thickets. While pawpaws have the potential to produce the most fruit when growing in full sun, young trees are very sensitive to sunlight and should be kept shaded until they are at least 1.5 feet tall. The flowers are self-incompatible, meaning they require pollen from a different cultivar (variety) to be properly fertilized. Pawpaw leaves turn yellow or gold in fall. Therefore, pawpaws should be planted in groups with at least two different cultivars. Flowers are borne on previous year’s wood and will bloom mid-spring. The flowers are deep maroon or purple in color and have an unpleasant odor. In contrast, ripening fruit fill the air with a lovely aroma. 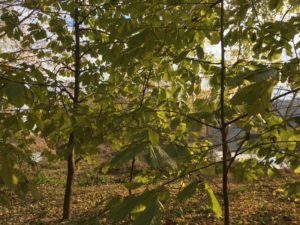 In the fall, pawpaw leaves turn golden yellow and do not drop quickly, so they have the potential to provide lasting color in the fall landscape. Pawpaw trees grow best in fertile, well-drained, slightly acidic soil (pH 5.5-7). Plan to provide ample water to pawpaw trees, especially during the establishment year. To train the tree to grow as a single stem, remove suckers that sprout during the early years. Or, leave suckers on the tree to train the tree as a hedge or screen plant. Trees started from seed will produce fruit in 5-8 years, and grafted cuttings can produce fruit in as little as 3-4 years. The best time to plant pawpaws is while the tree is not actively growing- early spring or fall. There are a number of nurseries that raise and sell pawpaws, so it is possible to purchase saplings of different cultivars or even grafted trees. Pawpaws can be started from seed or vegetatively propagated through a variety of techniques. You can also transplant trees from the wild. However, the taproot is easily damaged during transplanting, which will often result in tree death. As a result, saplings grown in containers have a higher transplant survival rate. You can collect wild fruit, save the seed, and start saplings from these seeds. To save pawpaw seeds, collect ripe fruit, remove all pulp from the seed, and place in a cold, moist spot for 90-120 days. Do not let the seeds dry out before planting. If you are looking to add a nutritious, native tree to your landscape, consider the pawpaw. The North Carolina Pawpaw festival occurs in late summer each year in Forsyth County. Anyone interested in connecting with experienced pawpaw growers should consider attending in future years. 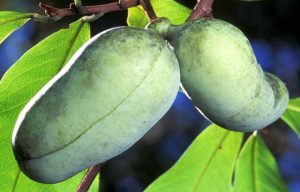 For more information on growing pawpaws and recommended varieties, see the following publication: http://www.clemson.edu/extension/hgic/plants/vegetables/tree_fruits_nuts/hgic1360.html.